Many of us are filled with a natural human anxiety, worrying when we stand before a congregation to celebrate or preside at the Eucharist or the Holy Communion, or to assist. So much so, that we may be in danger of forgetting that we too are present among the congregation, to be enriched and fed spiritually as we meet Christ, present in word and sacrament. The Eucharist is the great thanksgiving – eucharistia (εὐχαριστία) – for the great goodness of God. Whether we call this ‘The Eucharist,’ ‘The Holy Communion,’ ‘The Sacrament,’ or ‘The Lord’s Supper,’ this is the central act of Christian worship where Christ encounters and feeds his faithful ones. As we have it, this service is not simply the Lord’s Supper, the Holy Communion, or the Eucharist. It is a combination of both a Liturgy of the Word, a Prayer Service, and a Liturgy of the Sacrament. So let us watch for these six moments as we are gathered together. The Greek work ἐκκλησία ekklesía, which we translate as ‘Church,’ refers to the gathering of the people, the calling out of the world and into the assembly. Before the arrival of the priest, the congregation gathers. We are here first and foremost as the gathered or assembled church, believers. Others may be guests, and welcomed guests, but it is not a secular gathering, on the one hand, nor, on the other hand, is it a meeting for evangelism. The presumption first and foremost is that those present are baptised believers. Already, the candles are lit and the lectern has been dressed in the liturgical colours of the season: Green for Orinary time, for we are outside any particular season of the Church: think of green as the ordinary colour of nature, the green of the trees, of plants, of the fields; or think of the green in traffic lights that allow us to continue on our ordinary journeys in life. The memory of the silent prayers said by the priest before presiding or celebrating is retained in Holy Communion 1 in The Book of Common Prayer, where it says ‘The priest stands at the Lord’s Table. The people knell.’ And then he or she prays the Lord’s Prayer (without the doxology) alone. We too should be silent as we gather our thoughts, our minds, ourselves, as we prepare to celebrate. In common language, we normally use the words ‘celebration,’ ‘celebrating’ and ‘celebrant’ for the person presiding at the Eucharist or the Holy Communion. But we are all celebrating, celebrating together, we are all co-celebrants, and the person who presides is the one who seeks to bring it alive, to animate what is happening, to see that it truly is the liturgy, the work of the people, and not something we are present at as spectators. The people have gathered, the many have come together to be one body. We are social and sociable. We chat with one another. But we are not collected individuals, and small groups of twos or threes. We are about to be gathered together as one people. The priest who is presiding is the last to enter, and we stand – in silence or singing a hymn – ready to be gathered together as one body. The priest joins us before the altar or table. Our worship does not open or begin with the processional hymn. It opens or begins when we are gathered together as one body when the presiding priest stands at the president’s chair and calls us together in the opening liturgical greeting. And we know why we are celebrating this Eucharist together this afternoon. Christ is present among us in so many ways: in word, in sacrament, and in the gathered Body of Christ. And so, in awe and reverence, we draw our hearts and minds together and prepare to enter fully into worship, praying the Collect for Purity. This prayer comes to us as an inheritance of Sarum Use, and was so loved that it has survived in The Book of Common Prayer ever since 1549. Penitence as part of the gathering of the people has been an integral part of Anglican liturgy since 1556. God so loved the world that he gave his only Son Jesus Christ, to save us from our sins, to intercede for us in heaven, and to bring us to eternal life. Then there is silence to think about this. In Holy Communion 1, the canticle Gloria comes after receiving Communion. Its present place restores the canticle to the place it had in 1549. We have been forgiven, now – like the angels and shepherds – we can give Glory to God who comes among us. The canticle Gloria in Excelsis may be omitted in Advent and Lent and on weekdays which are not holy days, and so we omit it today, a weekday in Ordinary Time, but not for any excuse of brevity. But when we use Gloria, we should use it joyfully. It is full of images that children love, and resonances of its words can be found in almost all Christmas carols, for example. Children love the story of this canticle. All Christmas carols, in some form, include words from it, and they delight in its images, its words and its pictures. Then comes the Collect. Once the meaning of a collect has been explained, people rarely forget, because we all know what is to ask for our basic needs to be met. That is natural … I need, I need, I need, I feed, I feed, I feed … therefore I am? A collect is literally a collection of all the intentions and favours we seek, for the Church, for ourselves, for the world. for you live and reign, one God, for ever and ever.. 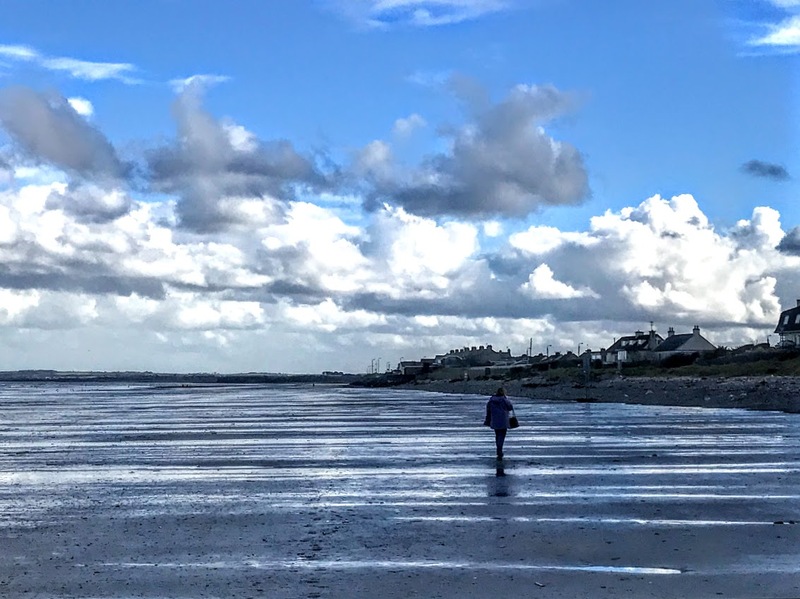 In our worship, the Church of Ireland seeks a balance between Word and Sacrament. Both are important places for Christ being made present for us, for us presenting ourselves before Christ. Colin Buchanan has summarised the Eucharist as ‘A Bible study, followed by a prayer meeting, followed by a meal.’ And so, Proclaiming and Receiving the Word is not preliminary to, or preparation for the Eucharist. It is both proclaiming and receiving. It is an essential part, an indispensable element of every celebration. Properly, the full Word of God should be proclaimed … Old Testament, Psalm or Biblical Canticle, New Testament and Gospel. Otherwise, we have to ask, are we saying the Old Testament has lost its validity or – even worse – suggesting the God of the Old Testament is not quite the same as the God of the New Testament? 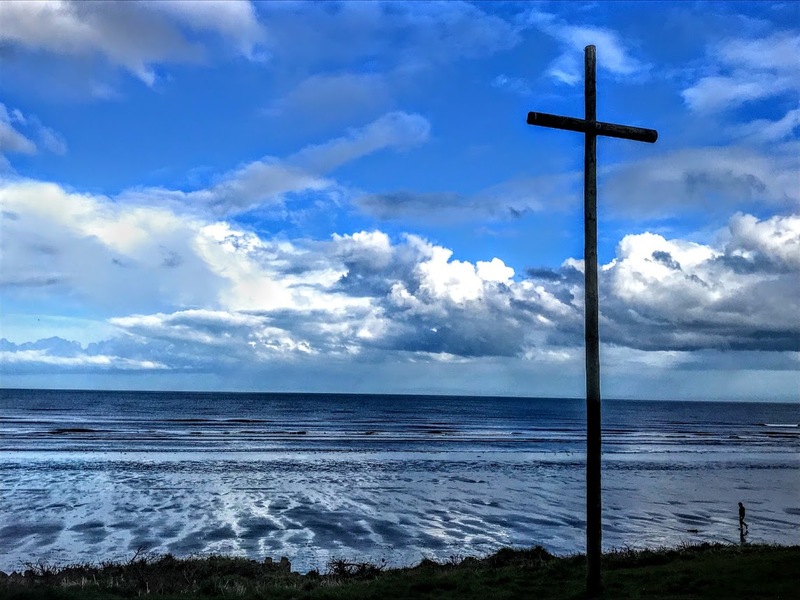 Unfortunately, the Daily Lectionary of the Church of Ireland for today provides only for a New Testament reading [I Peter 1: 3-9], a psalm [Psalm 111], and a Gospel reading [Mark 10: 17-27]. Blessed be the God and Father of our Lord Jesus Christ! By his great mercy he has given us a new birth into a living hope through the resurrection of Jesus Christ from the dead, and into an inheritance that is imperishable, undefiled, and unfading, kept in heaven for you, who are being protected by the power of God through faith for a salvation ready to be revealed in the last time. In this you rejoice, even if now for a little while you have had to suffer various trials, so that the genuineness of your faith – being more precious than gold that, though perishable, is tested by fire – may be found to result in praise and glory and honour when Jesus Christ is revealed. Although you have not seen him, you love him; and even though you do not see him now, you believe in him and rejoice with an indescribable and glorious joy, for you are receiving the outcome of your faith, the salvation of your souls. The doxology, ‘Glory to the Father ...’ may be omitted, for the Psalms are valid Biblical prayers without having to be ‘Christianised,’ and it is also traditional to omit the doxology at the end of the Psalms during Lent and Advent. We often sing a canticle, psalm, hymn, anthem or acclamation as a gradual before proclaiming and receiving the Gospel. And that leaves us standing to receive the Word of God, facing the Gospel, which is best proclaimed and received, not from the table or the altar but among the people. Hear the Gospel of our Saviour Christ, according to Saint Mark, chapter 10, beginning at verse 17. As he was setting out on a journey, a man ran up and knelt before him, and asked him, “Good Teacher, what must I do to inherit eternal life?” Jesus said to him, “Why do you call me good? No one is good but God alone. You know the commandments: ‘You shall not murder; You shall not commit adultery; You shall not steal; You shall not bear false witness; You shall not defraud; Honour your father and mother.’” He said to him, “Teacher, I have kept all these since my youth.” Jesus, looking at him, loved him and said, “You lack one thing; go, sell what you own, and give the money to the poor, and you will have treasure in heaven; then come, follow me.” When he heard this, he was shocked and went away grieving, for he had many possessions. The word is not just proclaimed but is received, and we ought to take it for granted that at every celebration of the Eucharist there is an exposition of the World, so people can receive it, so we can own it, so we can integrate it into our faith. And the Liturgy of the Word then naturally reaches its climax when we share in the common confession of the faith of the universal Church, the Nicene Creed. We may use other creeds in other forms of worship, but The Book of Common Prayer insists on the Nicene Creed in the Eucharist, and on Sundays and Principal Holy Days. The intercessions normally include: prayers for: the universal Church; the nations of the world; the local community; those in need; and remembrance of, and thanksgiving for, the faithful departed. But each petition should be brief, and we should avoid making intercessions appear like a series of collects. They should be addressed directly to God, and not to the people – this is not the place for another sermon. But bear in mind firstly that these are the prayers of the people, not of the priest, and secondly, that you do not need to pray for all things at all services. Brevity and simplicity are important, corporate silence is important, and we should not hijack the prayers of others, the piety of others, and we should not displace the importance of the Great Thanksgiving, for the Eucharist itself is the Thanksgiving par excellence, and this should never be obscured by the content of the intercessions. We have been gathered together, we have heard God’s word together, we have found we share the same faith, we have prayed together. To draw on Colin Buchanan’s imagery, we have had our Bible study and our prayer meeting. 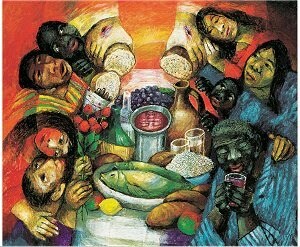 Now, before we share the meal … are we at peace with one another? The Peace is still objected to in some parishes. How it is introduced will shape whether it is acceptable and whether it is liturgical. In the Communion we are being reconciled with God and with one another, so this should not be any old peace. But we have more to offer. Most people think of the offertory as the collection. But it’s not, at all. It’s about offering God back what God has offered us … food and drink to nourish us, transformed by our labour, the fruits of our labour, our sweat and toil. And we offer that as we prepare to eat together. Now is the time to eat together, and so before the meal we prepare the table. In families, children love preparing the family table, love the idea of gifts being given and received. There’s not much chance of that happening at this point in a parish church if they have been sent out to Sunday school beforehand. If the priest washes his or her hands at Lavabo, it is good table manners. But over and over again, the Church uses water as a sign of purity and purification. and the bread of heaven. Amen. The Eucharist is not just words. It comes alive in action. And so there are four identifiable movements or actions we should watch out: taking, blessing, breaking and giving. First we have the Taking of the Bread and Wine. We sometimes get this so wrong. How often do we find the bread and wine are already on the table or altar, or on a credence table at the side where no-one can see them? If the bread is little bits of sliced pan already cut into tiny squares, how are we going to break the bread together? And the person presiding should show they are taking this bread and wine – and this is not about elevation. Only the bishop or priest then may say: ‘Christ our Passover …’ This is one of the roles of the president, and cannot be delegated. Like the opening greeting, this too states clearly what we are about to do. This is no longer bread and wine for secular use. What God has given to us for our sustenance we now offer to God. therefore let us celebrate the feast. The word Eucharist simply means thanksgiving. 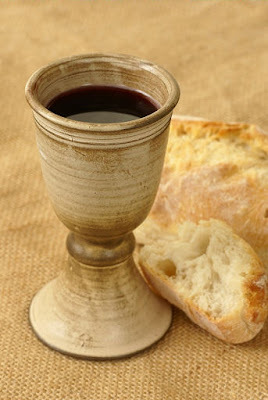 In a sense we are all lifting that Bread and Wine and saying thanks you for God’s gifts of life and what sustains life. There are three Great Thanksgiving Prayers in The Book of Common Prayer. We are using Prayer 3 this afternoon because it looks back to the past, looks to the present, and looks to the future, because it is remembrance and anticipation, because it is fully Trinitarian, and because its responses and refrains reminds us that Liturgy is the Work of the People, we are all celebrating together. The spirit of each of these three prayers is thanksgiving. It is not supposed to be quiet, or penitential, or singular. The appropriate posture is that all are standing, for all are celebrating. But how many people when they are leading the liturgy change this by asking people to kneel, or by asking them to kneel for the Sanctus? The only rubric for posture in Holy Communion is Stand, and, as Bishop Harold Miller says, the normal place for presiding is behind the altar or table, with hands out-stretched throughout the prayer. The whole prayer, and not merely the Biblical words recalling the Last Supper, is the Eucharistic Prayer. If after those words the bread and wine are raised up, it is in giving thanks. But it is the whole prayer that is what we may call the ‘consecration,’ it is all the Eucharist, the Lord’s Supper, the Holy Communion. we praise you for your goodness and your love. When we turned away you did not reject us. and prepared a table where we might feast with you. he made the perfect sacrifice for sin. you came to table with your friends. you are the true vine. one in Christ, our risen Lord. God of power and might. Thanks be to you, our God, for your gift beyond words. Taking, blessing … now we are about to notice the breaking and the giving. And we prepare for this in the words of The Lord’s Prayer. And now we have The Breaking of the Bread, what is also called the Fraction. is a sharing in the body of Christ. and feed on him in your hearts by faith with thanksgiving. Only when the invitation has been given, should the altar party receive Communion. It would be wrong for them to receive first and then invite others; this is the work of the whole Church, and there are not two categories or classes of baptised and communicant members. The rubric states specifically: the presiding minister and people receive communion, and states this after the invitation. And if you were at a meal, how appropriate it would be for us all to serve one another, to look after each other’s needs. Our ‘Amen’ is our Amen to Christ present to us and among us in so many ways this afternoon … in Word, in Sacrament, and in us collectively as the Body of Christ. When all have received Communion, all keep silence, not for some imposed act of piety, but for reflection on this awe-filled meeting with God. As the Bible reminds us constantly, the Fear of the Lord is the beginning of all Wisdom. Now we have been gathered, had our Bible study, our prayer meeting, and our meal together, we are ready for Going out as God’s People. We are ready for a Blessing to send us out into the world in mission. of the body and blood of your Son Jesus Christ. to live and work to your praise and glory. Amen. And that’s it, Let’s go! Rosalind Brown, Christopher Cocksworth, On Being a Priest Today (Cambridge MA: Cowley, 2002). Stephen Burns, Liturgy (London: SCM Press, 2006). Mark Earey, Liturgical Worship: a fresh look, how it works, why it matters (London: Church House Publishing, 2002). Howard E. Galley, The Ceremonies of the Eucharist, A Guide to Celebration (Cambridge MA: Cowley Publications, 1989). Richard Giles, Creating Uncommon Worship: transforming the liturgy of the Eucharist (Norwich: Canterbury Press, 2004). Robert Hovda, Strong, Loving and Wise: Presiding in Liturgy (Collegeville, MN: The Liturgical Press, 1976). Harold Miller: The Desire of our Soul: a user’s guide to the Book of Common Prayer (Dublin: Columba, 2004). Benjamin Gordon-Taylor and Simon Jones, Celebrating the Eucharist, A Practical Guide (London: SPCK, 2011 edition, Alcuin Liturgy Guides 3). Benjamin Gordon-Taylor and Simon Jones, Celebrating Christ’s Victory, Ash Wednesday to Trinity (London: SPCK, 2009, Alcuin Liturgy Guides 6). (Revd Canon Professor) Patrick Comerford is Priest-in-Charge, the Rathkeale and Kilnaughtin Group of Parishes and Director of Education and Training, the Diocese of Limerick, Killaloe and Ardfert. This ‘Teaching Eucharist’ was celebrated in Saint Mary’s Church, Askeaton, Co Limerick, on 28 May 2018 as part of the continuing education and training programme for clergy and readers in the diocese. The words in red italics were read by Stephen Fletcher, a reader as narrator. Sunday next, 3 June 2018, is the First Sunday after Trinity. The readings in the Calendar of the Church of Ireland are: I Samuel 3: 1-10 [11-20]; Psalm 139: 1-5, 12-18; II Corinthians 4: 5-12; and Mark 2: 23 to 3: 6. The readings and other provisions can also be found as Proper 4B, when the Sunday between 29 May and 4 June comes after Trinity Sunday. When it comes to preparing the readings for next Sunday, it should be noted that there are options for a shorter and longer version of the Old Testament reading, and that the numbering of the Psalm verses varies from those in the Revised Common Lectionary because of the differences in numbering the verses in the Revised Common Lectionary and in the translation of the Psalms in the Church of Ireland Book of Common Prayer. 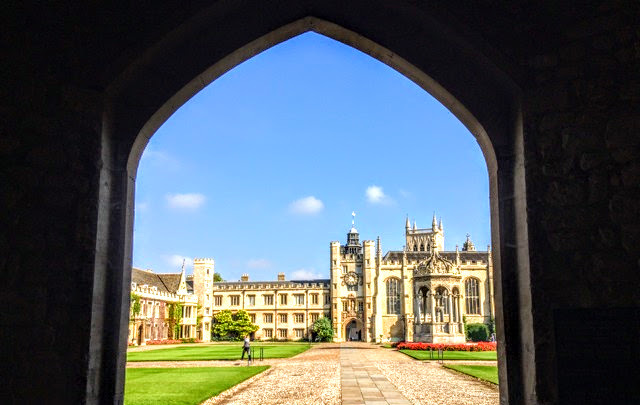 We are in Ordinary Time, and while we number the Sundays ‘after Trinity,’ there is no season of Trinity, and this sequence of numbering continues for the next four or five months, until late October. By coincidence, some feast days are going to fall on Sundays over the next few months, including the Birth of Saint John the Baptist (24 June) and Saint Mary Magdalene (22 July). Otherwise, however, there is no climax, no continuous theme, or no great celebration to make this ‘Ordinary Time’ in any way extraordinary. Instead, the Lectionary encourages us to continue reflecting on the main themes in the Gospel readings. In Year B, that Gospel is the Gospel according to Saint Mark. However, with the exception of a few Sundays, we interrupted our readings from Saint Mark, drawing on Saint John’s Gospel for many of the Sundays in the seasons of Lent. Next Sunday, we return to Saint Mark’s Gospel, and we are invited once again, to journey with Christ as he makes his way to Jerusalem. ● The Gospel reading talks about the feeding and healing we experience in our lives when we rest in God. We have already read this passage and the accompanying Psalm earlier this year, on the Second Sunday after the Epiphany (14 January 2018). But the choice of this reading again for next Sunday begins a series of readings that follow Israel’s history after the settlement of the Promised Land. These begin with this story of the call of the boy Samuel, which lays the foundation of Samuel’s learning to recognise God’s voice and his call to prophetic ministry. Along with the Psalm and the reading from II Corinthians, this reading asks us how we know who we are and what we are meant to be doing. Samuel arrives at a troubled time when things were out of control, when ‘there was no king in Israel,’ and when everyone ‘did what was right in their own eyes’ (Judges 21: 25). The boy Samuel is confused about who is calling him. He keeps thinking Eli is calling him. But his confusion does not keep Samuel from being willing, again and again, to respond to the call. 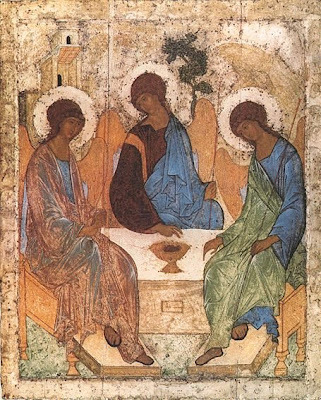 God’s call comes to Samuel, not once or twice, but three times, which may help us to recall what we have said about the Trinity in our sermons the previous Sunday. How have you been called? Have you shared the story of your call with your parish and your parishioners? Eli plays such an important role in this story, helping Samuel understand what is happening to him. It is an essential role in ministry to have people who are willing to support, endorse, and guide people who are trying to discern a call from God. Samuel’s call came long before his mother brought him to the Temple. The Psalm continues this theme: ‘O Lord, you have searched me out and known me’ (Psalm 139: 1), and reminds us that God calls us, even when we are in the womb (Psalm 139: 13-16), and that even the darkest places God’s care is with us. Not only did God knit us together in our mother’s wombs, but this whole passage reads like we are in God’s womb, hemmed in by God behind and before. Our life is in God’s womb, which is a peaceful and comforting thought. We cannot go where God is not, and God, in a sense, is also chasing after us, insisting on having a relationship with us. The Psalmist says that God’s counsels are ‘more in number than the sand’ (Psalm 139: 18; 139: 17, NRSV), and if were to count them all we would still be in God’s presence. It is a majestic image of the scope of God’s presence. In his 1980 bestseller, Cosmos, the astronomer Carl Sagan wrote that there are more stars in the heavens than all the grains of sands covering the world’s beaches. He calculated that a handful of sand contains about 10,000 separate grains. But how many grains of sand cover the earth’s beaches? Some years ago, researchers at the University of Hawaii tried to calculate this number by dividing the volume of an average sand grain by the volume of sand covering the Earth’s shorelines. The volume of sand was obtained by multiplying the length of the world’s beaches by their average width and depth. The number they calculated was seven quintillion five quadrillion (that is 7.5 followed by 17 zeros or 7.5 billion billion) grains of sand. On top of this, astronomers now calculate that there are 10 stars for every grain of sand, 11 times the number of cups of water in all the Earth’s oceans, ten thousand times the number of wheat kernels that have ever been produced on Earth and 10 billion times the number of cells in a human being. This is a staggering number: 70 sextillion (or 7 followed by 22 zeros or 70 thousand million million million) stars in the observable universe. And that is probably a very, very low estimate because the number of galaxies filling the Universe is thought to be much larger than those the Hubble can see. This short, poetic passage that makes up our New Testament reading next Sunday presents a synopsis of what life in Christ looks like. It is part of Saint Paul’s long apology or personal defence for his apostolic ministry against some of his detractors (see II Corinthians 2: 14 to 6: 10). Saint Paul’s defence of himself is rooted in God’s promises, which are for everyone (see II Corinthians 1: 20 and 7: 1). Here he points to his inner life in Christ which provides all the strength he needs in his ministry and mission, despite all the frustrations and difficulties he faces. He seems to be saying that we are living in a new creation: ‘Let light shine out of darkness’ (verse 6), which is both the light of creation (see Genesis 1: 3) and the ‘light of knowledge of the glory of God in the face of Jesus Christ’ (verse 7). Just as humanity is created out of the clay (see Genesis 2: 7), we are ‘clay jars’ – cheap and fragile – but in those clay jars we hold that great treasure which is our life in Christ. Saint Paul is being poetic when he speaks of how ‘we are afflicted in every way, but not crushed; perplexed, but not driven to despair; persecuted, but not forsaken; struck down, but not destroyed’ (II Corinthians 4: 8-12). ἐν τῷ σώματι ἡμῶν φανερωθῇ. ἐν τῇ θνητῇ σαρκὶ ἡμῶν. ἡ δὲ ζωὴ ἐν ὑμῖν. Here too Saint Paul is also drawing on language found in the psalms, prophets, and wisdom literature. He could also be appropriating traditions about the life of Christ that later influence the Gospel writers (for example, see Psalm 22: 1 and Mark 15: 34). He is saying that all that distorts and spoils our created goodness dies in Christ and that Christ’s life is manifest as the flourishing of new creation in our lives. We return to reading Saint Mark’s Gospel on Sunday next with his accounts of two controversies that occur on the Sabbath: one in the grain fields (Mark 2: 23-28), and the second in a synagogue (Mark 3: 1-6). These two scenes lay the foundation for the account in this Gospel of the conflict between Jesus and the religious authorities of the day, and they also set the stage for our readings from Saint Mark’s Gospel from now until mid-November and the Second Sunday before Advent [18 November 2018]. For convenience, I have divided these reflections on this Gospel passage into three sections: Mark 2: 23-28; 3: 1-5; and 3: 6. The reading begins with the Greek telling us that Christ is bypassing the grainfields when the disciples make their way (ὁδός, hodos, verse 23) – the word used in Greek today for a street or road – through the fields. As long as they are plucking the heads of grain and not harvesting it, they are allowed to so this, and there is no question of any theft (see Deuteronomy 23: 24-25). What concerns the Pharisees here is not theft, but that the disciples are gleaning on the Sabbath, and they challenge Christ about this. For the Pharisees, this behaviour appears to ignore the mandate to observe the Sabbath and keep it holy (see Exodus 20: 8; Deuteronomy 5: 12). Perhaps they thought the disciples could have prepared food the previous day to take with them. Jesus disagrees, not because he is trivialising the laws about the Sabbath, but because he sees the Sabbath in a different light. He turns to a story about David, who is fleeing Saul who is plotting to kill him (see I Samuel 21: 1-6). David takes consecrated bread that was supposed to be part of the 12 loaves reserved for the priests (see Leviticus 24: 5-9) and feeds it to his followers who are on the journey with him. By meeting the needs of David’s hunger, the priest sustains the life of a weary traveller and contributes to David’s quest to fulfil his calling to be the king anointed to replace Saul (see I Samuel 16: 1-13). Why, in this story, does Jesus identify the priest who assists David as Abiathar? The account in I Samuel 16 names the priest as Ahimelech. Who is mistaken in this passage … Jesus? Saint Mark? An unknown and unidentifiable redactor? There are details here that are not in the original story: David was not explicitly acting from hunger, and he does not enter the house of God to eat the bread of the presence. I have read many attempts to reconcile this Gospel account and the story of David, most of them setting out with the premise that the ‘inerrancy’ and ‘infallibility’ of Scripture must be defended at all costs, without seeking to debate the literary genre found in this passage. Perhaps Christ is displaying an ironic sense of humour here. He asks his protagonists: ‘Have you never read what David did … when Abiathar was high priest?’ (verses 25-26). If they say no, they show they have not read this story; if they say yes, they show are not truly familiar with the details of the story? Christ then offers a legal opinion derived from scripture itself. He argues that sometimes certain demands of the law are rightly set aside in favour of greater values or needs, especially when those needs involve someone’s well-being, and this can bring God’s blessings. His argument is not novel at all and would not have been scandalous. He is restating Deuteronomy 5: 12-15, in which God institutes the sabbath so a people who were once slaves could forever enjoy rest. 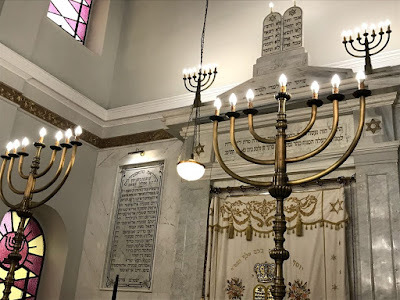 Rabbinic traditions from the time express similar opinions: ‘The Sabbath is given for you, not you to the Sabbath’ (b. Yoma 85b) and ‘Profane one Sabbath for a person’s sake, so that he may keep many Sabbaths’ (Rabbi Nathan). The proper function of the sabbath is to promote life and to extol God as the liberator. The Pharisees understood this. Perhaps the more subtle cause of conflict is the conclusion that Christ is the heir to David and David’s calling, and his reference to the Son of Man as the κύριος (kyrios) or Lord of the Sabbath. This is a less-than-subtle claim, for the word κύριος (kyrios) is used at the time in the Septuagint, the Greek translation of the Hebrew Bible, to convey the very name of God. Jesus is presenting himself on the Sabbath as no ordinary teacher or rabbi. 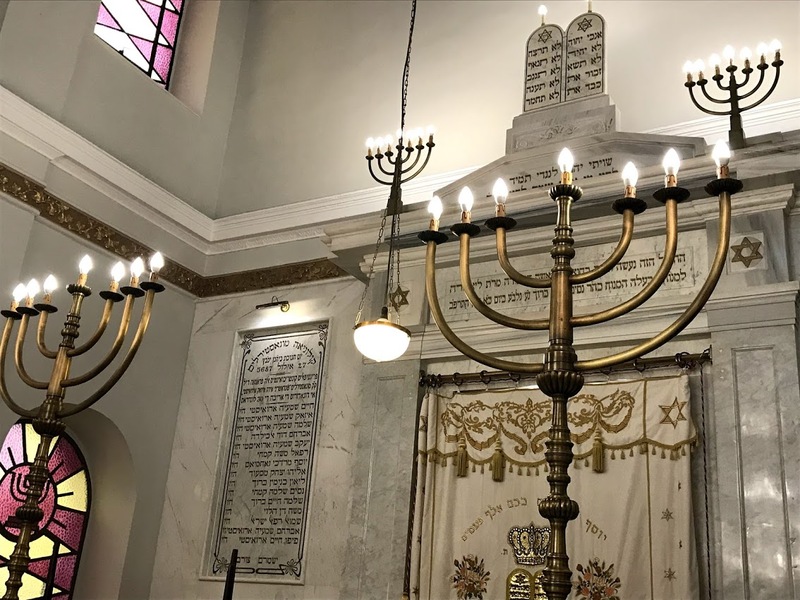 The second part of the reading is set once again on the Sabbath, but this time in a synagogue. But even before the healing takes place, a debate begins. This debate is not about whether Christ has the right or the power to heal the man’s withered hand, or even whether it is appropriate for him to do this in a synagogue, but whether doing this on the Sabbath shows disdain for the law of God. Of course, the man is not dying, although his hand was withered, and the act of healing could take place on any other day, indeed at any other venue. Even before they speak, Christ’s response to his potential protagonists is once again to ask a question: ‘Is it lawful to do good or to do harm on the sabbath, to save life or to kill?’ (verse 4). If they say no, they show their ignorance of the law and the rabbinical tradition; if they say yes, how could they possibly disagree with what they know he is about to do? Once again, irony and humour trump suspicion and disdain. What better day is there than the Sabbath, a day meant to promote God’s commitment to humanity’s well-being, for the restoration of a man’s malformed hand, and in doing so to allow him to return to work with dignity, and to restore him to his full and rightful place in the community of faith that may have been denied to him? This story is about wholeness and restoration, but it also contains a foretaste of the Resurrection. In neither scene does Jesus attack, let alone reject, traditional Judaism, the law or the Sabbath obsolete. But after these two stories – and remember that we are only 79 verses into reading this Gospel – we are told that the Pharisees and Herodians conspire to destroy Jesus. It is an unusual and unexpected coalition between two very different groups. In many ways, Saint Mark’s entire Gospel is a story of recurring controversy and confrontation with the hard-hearted that leads to the Cross. Saint Mark also has good news to announce: the in-breaking reign of God that is also a story of compassion and of lives that are transformed. Sunday next, 20 June 2018, is the Day of Pentecost, or Whit Sunday. The Book of Common Prayer (2004) lists Christmas Day, Easter Day and the Day of Pentecost as the three Principal Holy Days on which ‘the Holy Communion is celebrated in every cathedral and parish church unless the ordinary shall otherwise direct’ (p 18). The readings in the Revised Common Lectionary for next Sunday are: Acts 2: 1-21 or Ezekiel 37: 1-14; Psalm 104: 26-36, 37b; Romans 8: 22-27 or Acts 2: 1-21; John 15: 26-27, 16: 4b-15. The reading from the Acts of the Apostles must be read, either as the first or second reading, and must not be omitted. But my first reason for going there was because of my interests in Patristic studies: this is the region that has given the Church the Cappadocian Fathers – the great writers, theologians and thinkers in the fourth century that included Saint Basil the Great, Bishop of Caesarea; his younger brother, Saint Gregory of Nyssa; and their friend, Saint Gregory of Nazianzus, who became Patriarch of Constantinople. I was excited that I was visiting towns and cities linked with the Cappadocian Fathers who advanced the development of theology, especially our Creeds and our doctrine of the Trinity. Early one morning, we descended into the depths of Derinkuyu or Anakou, the largest excavated underground city in Turkey. This multi-level city goes down 85 metres underground. It is large enough to have sheltered 20,000 people, along with their livestock and food, with churches, chapels, schools, wine presses, wells, stables, cellars, storage rooms, refectories and even a burial chamber. At the fifth or lowest level, I found myself in a cruciform church. 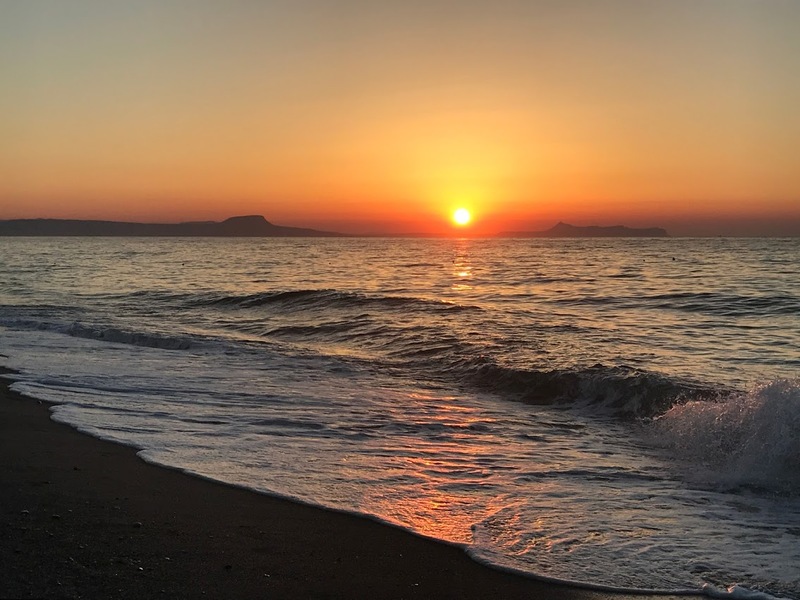 When I came up and emerged into the daylight, brushing my eyes, I was facing a stark reminder that until 1923 Derinkuyu was known to its Cappadocian Greek residents as Malakopea. Across the square from the entrance to the underground city stands the lonely and forlorn Greek Orthodox Church of Saint Theodoros Trion, like a sad scene in an Angelopoulos movie. They were there in Biblical times. We read about them next Sunday (Acts 2: 1-21). 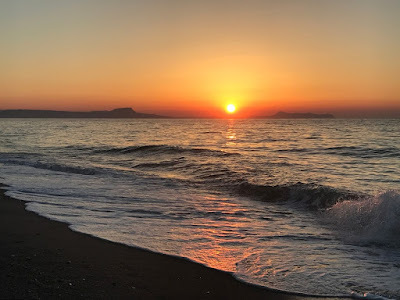 On the first day of Pentecost, we are told, the good news is heard by Parthians, Medes, Elamites, and residents of Mesopotamia, Judea and Cappadocia, Pontus and Asia, Phrygia and Pamphylia, Egypt and parts of Libya, visitors from Rome, Cretans and Arabs – each in their own languages. The gift of the Holy Spirit remains with the Church – for all times. The gift of the Holy Spirit is for all who are baptised, who are invited to continue daily to hear the word, to join in fellowship, to break the bread, to pray – just as we do when we celebrate the Eucharist (see Acts 2: 42-47). At times, our thinking about the Holy Spirit is made difficult by traditional images of a dove that looks more like a homing pigeon; or tongues of fire dancing around meekly-bowed heads of people cowering and hiding in the upper room in Jerusalem, rather than a room that is bursting at the seams and ready to overflow. As we affirm our faith in the words of the Nicene Creed, shaped to a profound degree by those Cappadocian Fathers, as we say ‘We believe in the Holy Spirit,’ do we really believe in the Holy Spirit as ‘the Lord, the giver of life,’ in the Holy Spirit as the way in which God ‘has spoken through the prophets’? God never leaves us alone. This is what Christ promises the disciples, the whole Church, in the Gospel reading, as he breaks through the locked doors and breaks through all their fears (John 20: 19-23). [Jesus said to his disciples:] 26 ‘When the Advocate comes, whom I will send to you from the Father, the Spirit of truth who comes from the Father, he will testify on my behalf. 27 You also are to testify because you have been with me from the beginning. 4b ‘I have said these things to you so that when their hour comes you may remember that I told you about them. ‘I did not say these things to you from the beginning, because I was with you. 5 But now I am going to him who sent me; yet none of you asks me, “Where are you going?” 6 But because I have said these things to you, sorrow has filled your hearts. 7 Nevertheless, I tell you the truth: it is to your advantage that I go away, for if I do not go away, the Advocate will not come to you; but if I go, I will send him to you. 8 And when he comes, he will prove the world wrong about sin and righteousness and judgement: 9 about sin, because they do not believe in me; 10 about righteousness, because I am going to the Father and you will see me no longer; 11 about judgement, because the ruler of this world has been condemned. In the Church calendar, we celebrate the coming of the Holy Spirit as an event that happened at the great festival of ingathering, Pentecost, 50 days after Passover, following Saint Luke’s symbolic timing. On the other hand, in Saint John’s Gospel, the Holy Spirit is the gift of Christ’s resurrection, on the Day of the Resurrection day (see John 20: 21-22). Yet, of course, both are true. Christ has not left us on our own, so that we may soar into spiritual fantasy and relish the prospects of more magic and more religion. Our task as disciples is to bear fruit, to let the seed sown in death rise to new life. What matters is life and love. This Gospel reading is the part of Christ’s last discourse with the disciples. He speaks about the gift of the Holy Spirit and the character of the Holy Spirit. The context of this speech is that in the Gospel of John, the audience, beginning in chapter 13, is addressed as disciples. This reading is part of that concluding discourse that goes on for 20 to 25 minutes. It is the most intimate time in the whole of the Gospel story between Christ, the disciples and God the Father – it is a time when all of these are brought together. At this intimate moment after the Last Supper, Christ continues to tell the disciples about the mission they are to going to be part of. The Church too is to witness to and to work with the Holy Spirit, by living the life that Christ made possible, continuing Christ’s work in the world (15: 27). Why does Christ say: ‘yet none of you asks me ...’ (16: 5)? They have asked the question earlier (see John 13: 36 and John 14: 5). Perhaps he is saying that when our hearts are filled with ‘sorrow’ or we are preoccupied with ‘sorrow’ (John 16: 6), we are missing the main point: the coming of the Spirit. Then in the next verse (John 16: 7), Christ tells the disciples that by leaving them he is able to send the Paracelete. ● judgment – because the ruler of this world has been condemned (16: 11). In verses 12-13, we are told the Spirit will tell the disciples things Christ has not told them. In his guidance, he will speak what comes to him from God, as Christ has spoken what the Father has told him. The Spirit will prophesy about events ‘to come,’ the Spirit will reveal the essential nature of God, and the Spirit will glorify or show Christ’s essential nature and power (16: 14). Whether the word comes from the Father, the Son, or the Spirit, it is the same. 1, Someone who consoles or comforts. 2, Someone who encourages or uplifts. 4, Someone summoned or called to one’s side, especially called to one’s aid. 5, Someone who pleads another’s cause before a judge, a pleader, the counsel for the defence, a legal assistant, an advocate. 6, Someone who intercedes to plead another person’s cause before another person, an intercessor. 7, In the widest sense, a helper, one who provides succour or aid, an assistant. So, in its use, παράκλητος appears to belong primarily to legal imagery. In this passage from Saint John’s Gospel, it is used beside the language of testifying, and where the activity of the Paraclete is to lay down evidence sufficient to win a case on a number of issues awaiting judgment. The word παράκλητος is passive in form, and etymologically it originally signified being ‘called to one’s side.’ The active form of the word, παρακλήτωρ (parakletor), is not found in the New Testament but is found in the Septuagint in the plural, and means ‘comforters,’ in the saying of Job regarding the ‘miserable comforters’ who failed to rekindle his spirit in his time of distress: ‘I have heard many such things; miserable comforters are you all’ (Job 16: 2). However, the word παράκλητος in passive form is not found in the Septuagint, where other words are used to translate the Hebrew word מְנַחֵם‎ (mənaḥḥēm, ‘comforter’) and מליץ יושר (Melitz Yosher). ‘Citizens of Athens, I do not doubt that you are all pretty well aware that this trial has been the centre of keen partisanship and active canvassing, for you saw the people who were accosting and annoying you just now at the casting of lots. But I have to make a request which ought to be granted without asking, that you will all give less weight to private entreaty or personal influence than to the spirit of justice and to the oath which you severally swore when you entered that box. You will reflect that justice and the oath concern yourselves and the commonwealth, whereas the importunity and party spirit of advocates serve the end of those private ambitions which you are convened by the laws to thwart, not to encourage for the advantage of evil-doers’ (Demosthenes, On the False Embassy, 19: 1). In Jewish writings, Philo of Alexandria speaks several times of ‘paraclete’ advocates, primarily in the sense of human intercessors. The word later passed from Hellenistic Jewish writing into rabbinical Hebrew writing. 2, In Saint John’s Gospel, it is used four times (14: 16, 14: 26, 15: 26, and 16: 7), where it may be translated into English as counsellor, helper, encourager, advocate, or comforter. In the first instance (John 14: 16), however, when Christ says ‘another Paraclete’ will come to help his disciples, is he implying that he is the first and primary Paraclete? 3, In I John 2: 1, παράκλητος is used to describe the intercessory role of Christ, who advocates for us or pleads on our behalf to the Father. The Early Church identified the Paraclete with the Holy Spirit (Το Άγιο Πνεύμα) received in the accounts in the Acts of the Apostles (see Acts 1: 5, 1: 8, 2: 4, and 2: 38; see also Matthew 3: 10-12 and Luke 3: 9-17). The word Paraclete may also have been used in the Early Church as a way of describing the Spirit’s help when Christians were hauled before courts. Christ has already promised, ‘When they bring you to trial and hand you over, do not worry beforehand about what you are to say; but say whatever is given you at the time, for it is not you who speak, but the Holy Spirit’ (Mark 13: 11; see Luke 12: 11-12). So, the role of the Spirit is to make a case for Christ in the court of the world and to help us to do so. That is our task in mission as the Church. Quite often we think the gift of the Holy Spirit is something to consider only at ordination or at confirmation, or it is just left as a gift for Charismatic Evangelicals to talk about. But the gift of the Holy Spirit does not stop being effective the day after confirmation, the day after ordination, the day after hearing someone speaking in tongues, or the day after Pentecost. The gift of the Holy Spirit marks the beginning, the birthday, of the Church. And this is a gift that does not cease to be effective after Pentecost Day, even if the lectern and pulpit falls change from red to green. The gift of the Holy Spirit remains with the Church – for all times. Indeed, in the Orthodox Church they speak eloquently of the Church being the realised or lived Pentecost. We celebrate the Feast of Pentecost 50 days after Easter and on the Sunday that falls 10 days after the Ascension. 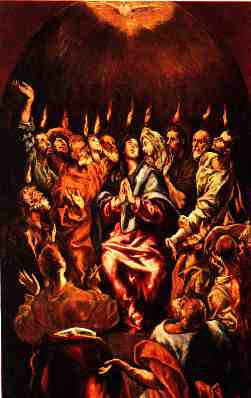 Pentecost recalls the descent of the Holy Spirit upon the Apostles at Pentecost. But it is also the Birthday of the Church, founded through the preaching of the Apostles and the baptism of the thousands who on that day believed in the Gospel of Christ. The icon of the Feast of Pentecost is an icon of bold colours of red and gold signifying that this is a great event. The movement of the icon is from the top to the bottom. At the top of the icon is a semicircle with rays coming from it. 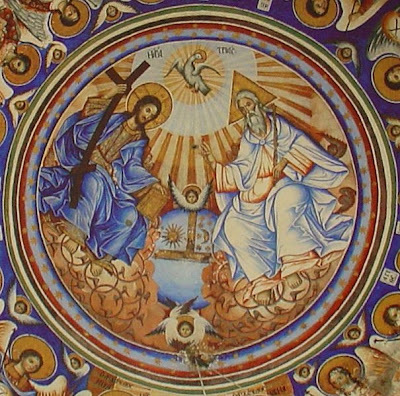 The rays are pointing toward the Apostles, and the tongues of fire are seen descending upon each one of them signifying the descent of the Holy Spirit. The building in the background of the icon represents the upper room where the Disciples of Christ gathered after the Ascension. 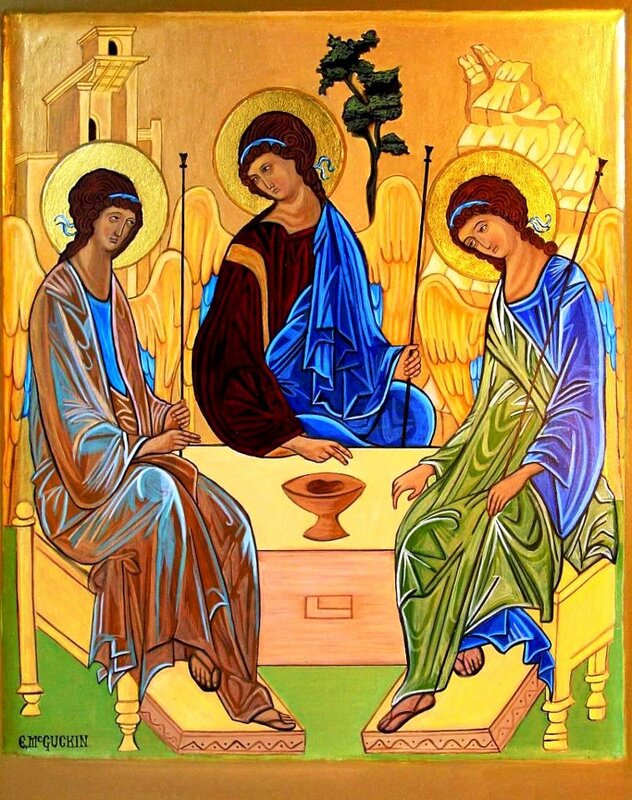 The Apostles are shown seated in a semicircle which shows the unity of the Church. Included in the group of the Apostles is Saint Paul, who, though not present with the others on the day of Pentecost, became an Apostle of the Church and the greatest missionary. Also included are the four Evangelists – Matthew, Mark, Luke, and John – holding books of the Gospel, while the other Apostles are holding scrolls that represent the teaching authority given to them by Christ. In the centre of the icon below the Apostles, a royal figure is seen against a dark background. This is a symbolic figure, the κόσμος (cosmos), representing the people of the world living in darkness and in sin. However, this figure carries in his hands a cloth containing scrolls which represent the teaching of the Apostles. The tradition of the Church holds that the Apostles carried the message of the Gospel to all parts of the world. In the icon of Pentecost we see the fulfilment of the promise of the Holy Spirit, sent down upon the Apostles who will teach the nations and baptise them in the name of the Holy Trinity. Here we see that the Church is brought together and sustained in unity through the presence and work of the Holy Spirit, that the Spirit guides the Church in the missionary endeavour throughout the world, and that the Spirit nurtures the Body of Christ, the Church, in truth and love. You are the King of glory, O Christ. Come Holy Ghost, our souls inspire.